JAI CMOS/CCD cameras are ideally suited to factory environments where vision-based systems are being used to improve efficiency, increase quality, reduce waste, and lower overall production costs. JAI provides one of the broadest machine vision camera offerings of any industrial camera manufacturer in the world. JAI’s Go Series delivers an exceptional blend of small size, high versatility, and excellent performance, all at an entry-level price, making them the perfect starting point for a wide range of machine vision applications. 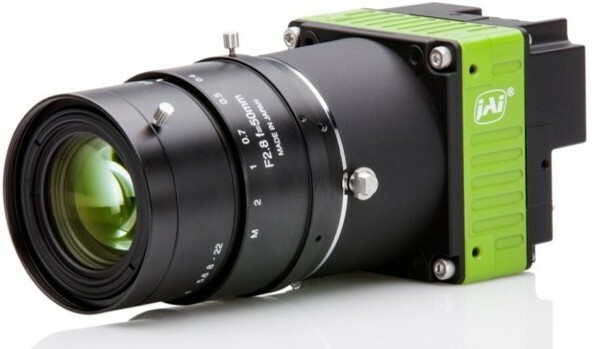 Spark Series cameras feature the latest CMOS imagers capable of high resolution images at speeds as much as 10 times faster than traditional CCD cameras. Multi-spectral cameras perform both visible and near-infrared inspection simultaneously, by splitting incoming light to two separate imagers. This makes it possible to use a single camera to simultaneously inspect both visible elements and sub-surface defects. JAI’s Apex Series is a range of 3-CCD and 3-CMOS area scan cameras delivering advanced RGB color imaging that’s ideal for demanding machine vision applications across a diverse range of industries. Advanced prism technology separates the incoming light into red, green, and blue wavelengths which are directed to three precisely-aligned sensors. Sweep Series includes both monochrome and trilinear color line scan cameras with line rates that are among the fastest available for their type and resolution. The Wave Series cameras are dual-band line scan cameras capable of sensing Short Wave InfraRed (SWIR) light. The cameras are based on Indium/Gallium /Arsenide (InGaAs) sensor technology and JAI’s prism line scan technology, making them capable of delivering dual-band imaging in the SWIR light spectrum (900 – 1700 nm). Uniforce Sales and Engineering is an authorized distributor of JAI products.